(NOTE: If you get squeamish about injuries, please stop reading. It’s really not a hugely bad injury and there won’t be anything graphic about it here, but if stuff like this puts you off, you best stop reading now!) Just earlier this week, I was excited to use the new mandoline that Rene and I got to help us cut really thin slices of food for dehydrating, frying or just plain old snacking. A mandoline is a slicer that helps you make very thin and uniform slices of the foods you are preparing. I was very excited because this tool because it meant I could slice really thin slices of apples (to be dehydrated into apple chips) and sweet potatoes to make into sweet potato fries (fried in lard or rendered duck fat). If you’re not sure what a mandoline looks like, go Google it, I would post a pic of it, but I’m still too close to the subject to be brave enough to post a pic of it here. Can you already guess what happened to me? This past Monday, I totally lived up to my “unaccomplished” alias to a most extreme! For some reason or another, I wasn’t being careful while I was slicing up some apples. And so the unthinkable happened, I was being careless and accidentally cut the tip of my thumb off! I know, you’re probably making a sound like something stings, that’s the response I’ve gotten from everyone in the ER, and everyone that I’ve told this to. But don’t feel too bad for me, luckily, it was only a very small tip of my thumb (and my nail is completely intact and not affected), and I’m told that it will grow back in time by my ER doctors. In the meantime, it only took me about 4 days to begin to function a little closer to normal (today, Friday, being the first day that I’ve felt like the pain in my thumb is bearable enough to venture out in public and show my face to people again, and also shamelessly admit to this blunder publicly). Okay, so what I did to my thumb sent me into a lot of pain, stress, and shame. And I feel like as ashamed as I am about doing something so foolish in the kitchen, this is exactly the kind of experience I wanted to share in this blog for my readers. Not because I want you all to know what pain I’m in, but because experiences like these usually teach me a lot about myself and the world. It’s times like this, when I do something so silly like not be super careful while using sharp tools in the kitchen, that I really feel quite depressed and ashamed of my lack of attention and highly foolish behavior. And it’s accidents like this that put the real dangers of sharp tools into real perspective for me. Sad to admit, this wasn’t the first time I had to run to the ER for a hand injury. In fact, this is the third time I’ve visited the ER for a hand related emergency, all of which involved my right hand. Yeah, I can be really careless with the safety of my right hand, I think that’s pretty clear now with injury number three! The other two incidences: 1. I accidentally slammed my first pointer finger in my car door, and 2. I had foolishly stuck my right hand into a small glass while washing dishes and the glass broke and cut my knuckle on the broken glass. Each time I come home from the ER, I feel bad and foolish for the silly mistake I made to merit an ER visit. And each time, I think I go into hiding feeling a lot of shame for being so stupid to have these little accidents happen to me. Well, this week, while I endured lots of pain while recovering, I decided that I wasn’t going to let myself beat myself up for my latest “unaccomplished” deed. I can’t say that I was hugely successful as I think I went through a lot of emotions coming to terms with the fact that I cut my thumb really bad. At times I even felt like I could understand what it might feel like to lose a limb. My injury was no where near as bad as losing a limb, but my roller coaster emotions definitely made me think of this plenty over the last few days. Now that the pain is starting to slowly subside, I think back to what Rene told me when we were leaving the ER and I was feeling really stupid, noting to myself that I’d been to the ER quite a lot for someone as young as me. In trying to make me feel better, Rene told me that young people don’t usually publicize to everyone when they do go to the ER. And that had me thinking a lot about how much shame I felt, and the stress I was going through, not because I was in pain and healing, but because I was ashamed to tell this to everyone. And so, this is a big reason why I’m sharing this with everyone on my very public blog. Yes, I was stupid and I admit it wholly, and me being able to say that so publicly actually makes me feel a lot better, less stressed, and ready to move forward with my injury. I imagine that I’ll have a lot more emotions to go through as my thumb slowly recovers back to normal, but at least I don’t have to beat myself into shame about it anymore, or at least not as much as before my admission. One of the things that all the ER doctors kept telling me while they were treating me was that I probably won’t be keeping my new mandoline anymore because of this accident. But, actually, I still am excited about the fact that this is a tool in my kitchen. I don’t want to poo poo my new mandoline just because I was being foolish, so while I may not exactly be using it myself anytime soon (I’ve gotta emotionally hype myself back up before I use it again), I don’t want to throw it out or never use it again. With time, I hope to use it a lot in my kitchen, and with all the safety precautions in place! And I’m reminded yet again how lucky I am to have Rene in my life. A relationship can be really tested when someone has to go to the ER and then come home with a severe injury, preventing them from doing simple day tasks. While this last week wasn’t a walk in the park, Rene has been so caring and kind to me that I feel like I am the luckiest girl in the world to have someone like him take care of me when I am injured. Alright, so this is me moving forward with my own personal injury. Anyone else want to share about their own silly blunders and/or ER visits? By all means, please share, we should’t be ashamed of our accidents, we should feel free to share so that others can learn from our mistakes! 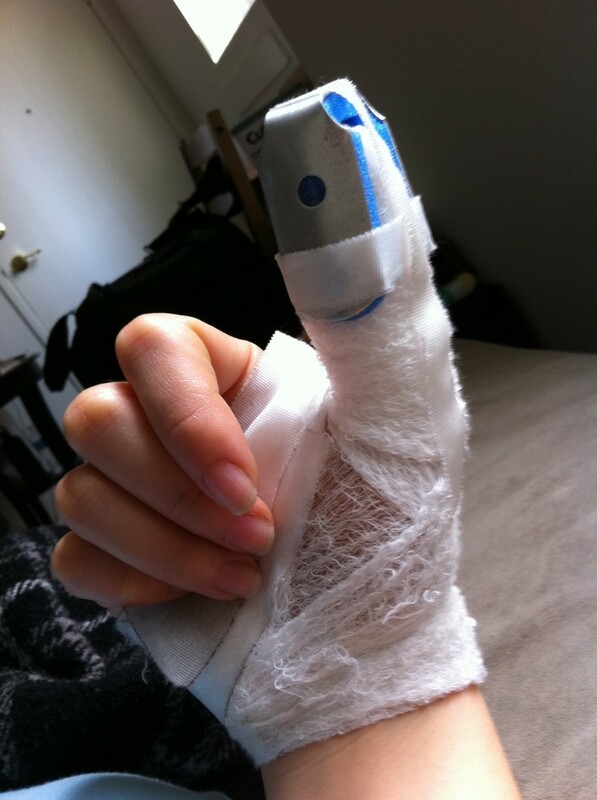 I mean, if no one learned to be more careful with a mandoline after I told them about my experience, I would truly feel that I had cut my thumb for nothing. 1. I bought my ex boyfriend a mandolin for his birthday. He also cut the top of his thumb off. Best part? I didn’t have a driver’s license and couldn’t drive him to the ER; we had to find his roommate and I think the time we lost led to some permanent (but minor!!) nerve damage. 2. While in Las Vegas volunteering for Obama, I decided to make some guacamole for my coworkers (because they were awesome and deserved such delectable treats). However, I am an idiot and de-pitted avocados by holding the half with the pit in my left hand and stabbing the pit with the point of the knife. Yes, I am an idiot (but I had die this so many times before without incident!). I missed the pit and stabbed my hand right at the point where my ring finger joins the palm. I was incredibly embarrassed and had to ask my host (coincidentally an ER nurse–he offered to sew it up there) to drive me to the ER. Six stitches, $800 bucks (no health insurance), and ruined guacamole later, I made chocolate chip cookies instead. Holy crap! I read this when you first posted it, but reading it made my thumb hurt, and it’s taken me a week to feel strong enough to reply! No worries, though, I think my thumb would have hurt anyways, it’s just my emotions were reliving my cut every time someone related a similar story to me. Wow, the mandoline accidents are just coming out everywhere. And ouch for having nerve damage! I wonder if I’ll have any long term damage from my cut. So far, it just feels so bruised and swollen all the time. The ER doctors said that mandoline accidents are pretty common, and that makes me shudder that more people aren’t aware of it. Ouch! Your avocado accident sounds horrible! I had to have 5 stitches on my knuckle injury, but your cut sounds way worse than mine was, especially with the location of your cut. But I’m glad you got back into the kitchen with the cookies. I’ve yet to really cook anything more than reheating stuff, but I’m hoping to get back to cooking soon. I Also cut off the tip of my thumb with a mandolin! It was my first time using it.I needed a skin graft, and it was tough for a couple of weeks. Everywhere I go now I am hearing stories of mandolin accidents!! I threw mine out, it is not worth the risk, too sharp and dangerous to have around. I suggest everyone do the same. There are too many of these accidents. In 30 years of constantly being in the kitchen, that is the first time I ever ended up with a bad injury. the mandolin is a disaster waiting to happen. I couldn’t agree more, I think they should force you to go through some safety training before you can even touch one! So true, I’ve certainly thought twice before using my mandolin again. These days I opt for my Cuisine Art food processor to do the same task rather than pulling out my mandolin! Well, I can relate … I am typing my story without the use of my right index finger because, yes, I used my mandoline (for only the second time ever) to slice garlic. Since garlic bulbs are so small, I couldn’t use the safety guard and thought I was being careful. But, I cut off a good chunk of my finger and after an hour & a half of icing, pressure and elevating it, the bleeding hadn’t subsided so I went to the ER. Funny guy nurse came into my room, sat down and said, “So, tell me how you cut your finger with a musical instrument” … when I explained the difference between a mandolin and a mandoline he says “I think it would be a better story if you told people it was a mandolin”. The doc ended up covering the cut portion with an absorbable hemostat (surgicel) and we waited a while to make sure that stopped the bleeding which it did, It still hurts 72 hrs later but it’s getting better. Seems like so many people have suffered from a mandolin accident. I can’t believe how many people have told me their version since I posted this. I really hope this post saves fingers and hands from the same fate!